Recognition AND protection are both important for volunteers when they help keep America beautiful. Economy cotton knit gloves. 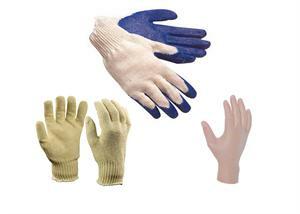 As with the latex palm glove they are knitted and stretch to accommodate different size hands. Can be reused. Priced PER PAIR. Our heavy duty vinyl gloves are 5 mil thick. These vinyl gloves are lightly powdered. Good for damp or wet are clean-up's, Priced by BOX of 100 gloves.